First off, quick introduction, I set this site up two years ago and never used it, so excuse the somewhat lame blog name. I used to blog quite a bit but don’t really have the commitment to write on a regular basis anymore and usually just rant away on the Spurs’ reddit. However, it’s difficult(impossible?) to post pictures along with a post on reddit and I have several pictures I want to put up, so I’m using this instead of a thousand links to imgur. The most often talked about development under Tim Sherwood with Tottenham has been the 4-4-2 formation they have set out in. Several members of the Spurs’ reddit and several writers, bloggers and so on have all said it is not a “strict” 4-4-2. Which is completely correct. And also not surprising, no team really plays a strict 4-4-2 in both the possession phase and defensive phases of play in the modern game. Much talk has been made of Adebayor dropping off into midfield, he does, Eriksen coming in from a wide left position, he does, fullbacks pushing on, they do, Soldado working the channels, he does, and so on. All the above is true but it’s the possession phase people continue to focus on when discussing Spurs’ formation. What is not spoken of as much is that it is very much a 4-4-2 in the defensive phase of play. And that’s where a formation really matters, the defensive shape, and Spurs have shown vulnerability in this setup at different stages of most of their matches. The one we all know about is the 2-0 defeat in the FA Cup to Arsenal and most level headed people agree Spurs can be found out by a midfield three intent on ball possession and rotation like Arsenal’s. But this weekend we saw Spurs exploited in a new way and very intentionally by Tony Pulis’ Palace side. The use of Maroune Chamakh playing off Cameron Jerome in a 4-4-1-1 shape was able to cause Spurs problems by presenting their centerbacks with a new problem to solve, who was going to deal with Chamakh in between the lines? The most dangerous instance of this situation resulted in a shot on goal from Jerome in the first half. An aerial ball is played towards Chamakh and with Bentaleb and Dembele covering their opposite midfield duo, Chiriches has to come forward and make a challenge, which he loses and the ball is flicked on to Jerome in a 1v1 with Dawson. Dawson handles the physical Jerome well enough and his effort on goal wasn’t overly threatening to Lloris. However, as we’ve seen this season, Dawson handles physical forwards well but has his issues with more nimble strikers. Had this been Jerome flicking on to Chamakh, Spurs may have found themselves in more trouble. Where as Spurs often look 4-5-1 in possession because Adebayor drops off and then 4-4-2 when defending because Adebayor forms the first line of the defensive block with Soldado, Pulis set up Palace in the opposite way, they were clearly 4-4-1-1 in possession but when they lost possession Chamakh again has a job to do, drop off into the midfield defensive line and sit in a bank of five, leaving Jerome to apply light pressure to Spurs centerbacks. This in turn left Bentaleb and Dembele with easy possession around the center circle. This easy possession in a non-threatening area certainly helped to inflate both Bentaleb and Dembele’s passing stats, the two alone played almost as many passes as Palace did as a whole. They really did, 182 were completed by the duo, Palace’s entire team completed 207. It’s a Tony Pulis side, but still. Palace was content to let them have possession around the center circle all they wanted and made their defensive stand deeper in their own area. Again, hardly a surprise, but Chamakh had to be disciplined and he was. Spurs found two ways to get around this in the second half, but before that, it should be said after watching the first half for a second time, Spurs actually moved the ball effectively through Palace’s half in the first forty-five minutes and were only lacking the final ball. Watching it live, I thought Spurs were horrid in the first half, but second time through, they were actually playing well enough. Credit has to be given to Palace here, they were fantastic in the first half both in defending and attacking. We can’t always blame Spurs for failing to get a goal at home and starting slowly, the other team can have an influence on the proceedings and Palace did not look like a relegation contender for the first forty-five minutes. The goals would come for the boys of White Hart Lane in the second half and thanks to the efforts of Adebayor they were able to find ways to break Palace’s defensive block. First, the most obvious, Adebayor draws in both of Palace’s centerbacks and wins an aerial duel on a long pass from Naughton and nods it on to Eriksen who finishes superbly. It was the simplest example of the big man/little man approach you will ever see, a fullback plays a long ball, it’s nodded on and put in the net, the ball barely touches the ground and the whole move takes barely any time at all. What may have been overlooked is that while Palace’s standing off was effective against Spurs’ midfield duo, that lack of pressure was also applied, or not applied, to Tottenham’s fullbacks. Normally this wouldn’t be an issue for Palace because both Rose and Walker look to get into midfield and push on frequently often leaving the centerbacks to control possession at the back. Spurs fullbacks would have been picked up by Palace’s wide mids if they pushed on and still left three midfielders to deal with Dembele and Bentaleb(and Adebayor when dropping). But Naughton, who came on for injury, not a tactical reaction by Sherwood, is more conservative in getting forward and took a chance in a 0-0 game by playing a long pass. And it came off. Normally, we would expect to see long passes from the back played from Dawson, but with Jerome expected to exert at least some pressure on Spurs’ centerbacks the one man unaccounted for in Palace’s defensive block is Naughton, an unlikely substitute(Walker as we know never comes off), and he makes them pay. What’s also interesting about the opening goal is again the combination of Eriksen and Adebayor, but more importantly, where is Soldado? He’s nowhere to be found in this sequence. 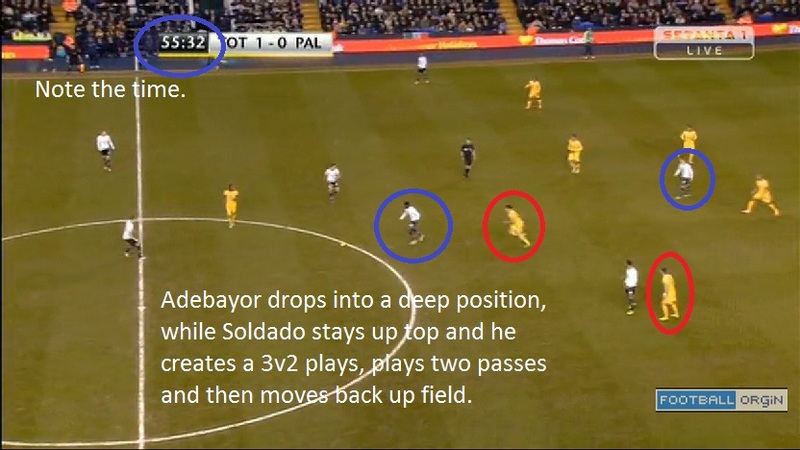 In fact, Soldado’s presence in this match was largely redundant. He was late making runs into the box, but Adebayor wasn’t, he didn’t drop off too much, but Adebayor did, and he wasn’t a target option in the middle much at all either, but Adebayor was. If there was a match under Sherwood that showed they don’t need to field both Soldado and Adebayor at the same time and still score goals this was it. Adebayor did the work to make himself useful in a variety of ways throughout, to the point where it’s a wonder Soldado wasn’t taken off for an attacking mid(or Chadli out to the left and Eriksen in the hole). Look at the goal again as the ball is coming into Adebayor, it’s him, Eriksen, a bunch of Palace defenders and no one else and the dynamic duo wins out and scores the opener. In the same move, Adebayor gets to the center circle, knocks around two quick passes to help Spurs unlock some space to play a forward pass to Lennon and while that passing move is taking place he gets back up top to be in a position for a potential ball from Lennon. Not trying to call out Soldado, but it needs to be said that part of Spurs renewed ability to score goals is probably from two strikers being played, but a lot of it seems to be from the simple fact that one of them is Adebayor. At some point one of Soldado and Adebayor is going to need to sit out a match. Either for rest or an injury, whether it be minor or major, the lack of squad rotation like under Harry looks like it could be rearing it’s ugly head under Sherwood. The side has been relatively unchanged and that included both strikers getting a run out in every match during the holiday period, even for the cup matches we saw neither of them sat down for another striker or a midfield player. Next Sunday Spurs have Swansea, who are struggling this year and in that glut of teams positioned 10-20th position with serious thoughts on being stuck in to a relegation battle. But, they do play 4-3-3, they beat United in the FA Cup last weekend and can cause Spurs problems in the middle. That, coupled with Soldado’s struggle to influence the game against Palace and the fact that him and Adebayor continue to get run out every match, creates the perfect timing to sit him. Spurs fitness issues being as they are, it’s ridiculous to suggest a starting eleven for Sunday on Monday, but a move to 4-4-1-1 with Eriksen behind Adebayor for the game against Swans is the logical decision.